Actors Boman Irani and Arshad Warsi are overjoyed and elated as their film 'Jolly LLB' has won two major awards. The film had Arshad Warsi, Boman Irani and Amrita Rao in lead roles. Actors Boman Irani and Arshad Warsi are overjoyed and elated as their film ‘Jolly LLB’ has won two major awards including Best Film (Hindi) and Best Supporting Actor at the 61st National Film Awards on Wednesday (April 16). Boman, who played the role of money minded Tejinder Rajpal in the film, tweeted his joy saying, “Overjoyed, elated and proud to learn that Jolly LLB wins National Award for best film. Good cheer @subkapoor”. Film’s lead actor Arshad Warsi is also happy with the award. He too tweeted: ‘Jolly LLB’. 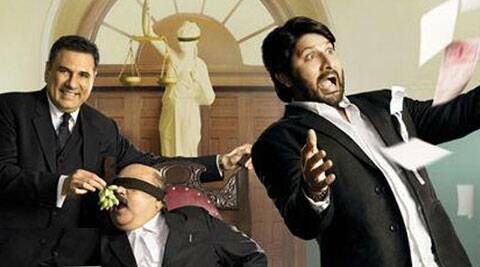 “JOLLY LLB has won the National award for Best Film… I am soooooooooo happy….,” tweeted Arshad Warsi. Boman Irani also congratulated his co-star Saurabh Shukla, who played Justice Tripathi, for winning the National Award for Best Supporting actor. “…… more elation. My friend @saurabhshukla_s wins best supporting actor. My good man….Richly deserved,” tweeted Boman. The lead actress of the film Amrita Rao also took to Twitter to congratulate her ‘Jolly LLB’ team. “Dude! Congratts Team JOLLY LLB..National Award Best Hindi Film..& Finally @saurabhshukla_s Justice for the Judge!! @subkapoor @ArshadWarsi,” Amrita tweeted. ‘Jolly LLB’ released in 2013 was a courtroom comedy drama film, written and directed by Subhash Kapoor. The film had Arshad Warsi, Boman Irani and Amrita Rao in lead roles. It revolved around the early life of Lawyer Jagdish Tyagi aka Jolly and focused on his attempt to earn six innocent wage earners their rights and his journey against the monopolistic behavior of the rich. The storyline was inspired by the 1999 hit-and-run case of Sanjeev Nanda.